The severance of axon from the nerve body initiates a series of coordinated events, which produce the disintegration of distal axonal segments, removal of myelin and remodelling of myelinating cells, and finally nerve fibre regeneration, by axonal growth from the nerve slump proximal to the site of insult. This process of nerve degeneration was discovered by Augustus Waller in 1850 and is generally known as 'Wallerian degeneration'. thickest axons to 250 mm/24 hours for the thinnest ones. 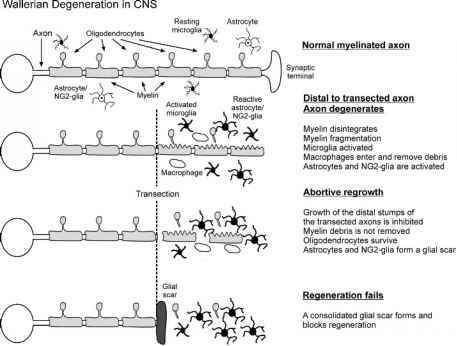 The process of demyeli-nation goes along with (1), degeneration of the axon, which is soon gone and its remnants are cleared by phagocytes arriving from neighbouring tissue or blood, and (2), proliferation of Schwann cells. After complete disappearance of the axon, the Schwann cells are already prepared to receive the sprouts of growing axons and begin their myelination. This particular arrangement underlies the remarkable regeneration potential of PNS (Figure 9.2). 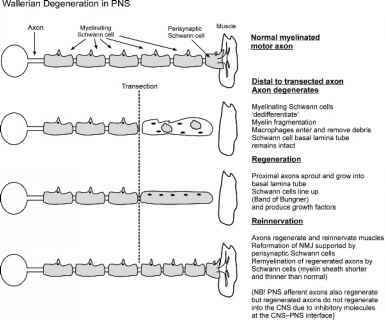 Regeneration of neuromuscular synapses is regulated by perisynaptic Schwann cells. Following muscle denervation the latter send processes which link the dener-vated endplates to the regenerating axons. the remnants of the nerve fibres with the astroglial scar. These determine the regeneration failure in damaged CNS axonal fibres. For many years, axonal degeneration following intersection was regarded as a result of ceased support form the cell body. Recently it became obvious, however, that Wallerian degeneration in the PNS is a specialized active process, which is not very dependent on the links with neuronal somata, but rather involves activation of localized signals in both axons and surrounding glial cells. This change in perception was initiated by the discovery of a spontaneously mutated mouse strain (called Wlds or 'ola'), in which peripheral nerves survive without any obvious changes for many weeks after transection. The full description of the local signals that initiate and control Wallerian degeneration is still wanting, yet it is clear that the enzyme system known as the ubiquitin-proteasome system (which includes ubiquitin regulatory enzyme UFD2 and the nicotinamide mononucleotide adeny-lyltransferase) plays a critical role. 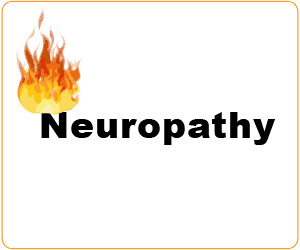 It was found that pharmacological inhibition of proteasomes delayed Wallerian degeneration in both peripheral nerves and optic nerve. Another important player involved in local signalling is represented by the Ca2+ -dependent proteases, calpains; inhibition of calpains or removal of Ca2+ delayed the onset and reduced the rate of Wallerian degeneration. 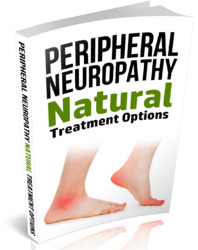 This discovery opens important perspectives for treatment of naturally occurring neuropathies associated with degeneration of peripheral nerves, which are, for example, common in diabetes, some forms of HIV infection and chemotherapy. What do wallerian cells do?